Barcelona are preparing a hefty £50m package to tempt Chelsea into allowing them to sign Willian, comprised of “their unsettled winger Malcom and a sizable fee”, according to the Mirror. It is not the first time that Catalan side have been linked with the twinkle-toed Brazilian but with the player now 18 months away from a free transfer and seven months away from turning 31 this could be the moment they get their man. “Yet with Malcom failing to impress in La Liga,” the Mirror continues, “Chelsea could decide they are not interested in him and may feel £50m is not enough for Willian.” That certainly seems the more likely conclusion to the story at the moment, with the Telegraph saying Chelsea have already rejected the offer. “Chelsea regard Willian as a key member of their squad and are looking to strengthen during the window rather than let first-team regulars go,” they sniff. The hum around Alvaro Morata continues. With Chelsea keen to bolster their forward line, Maurizio Sarri is said to be ready to cast Morata off into the Spanish sunset, with Atlético Madrid joining Sevilla in the race to land the striker. 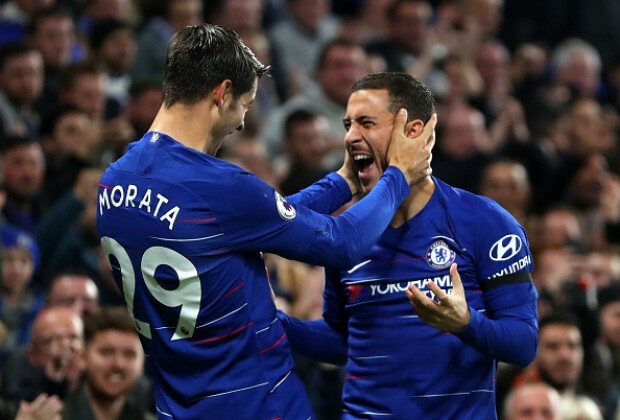 Morata’s £140,000-a-week salary could be taken off the books if they can ship him out on loan this month, freeing up funds to make a swoop for Callum Wilson or Gonzalo Higua?n, though Bournemouth will command around £50m for the former. If that figure makes you feel faint, then wait to hear of the dizzying sums of cash that Real Madrid are prepared to flutter in the direction of Napoli for their defender Kalidou Koulibaly. The European champions are mulling over splurging £90m on the Senegal defender, the kind of money they hope will blow Manchester United – another interested party – out of the water. Liverpool are also keen to strengthen at the back but are likely to baulk at the £50m price tag Burnley have slapped on the centre-half James Tarkowski; that’s effectively two-thirds of Virgil van Dijk. And Tottenham Hotspur are sniffing around a ball-playing defender too, with Sampdoria’s great Dane, Joachim Andersen, a target should Toby Alderweireld wander on to pastures new. Arsenal, meanwhile, fancy the idea of luring Yannick Carrasco away from China for a stint in north London, while Unai Emery is also weighing up a move for the Porto midfielder Héctor Herrera as a replacement for the Turin-bound Aaron Ramsey. Elsewhere, Newcastle are keen on Trabzonspor’s Abdulkadir Omur and Andy Carroll is desperate to extend his stay at West Ham, while Cardiff are still eyeing up the Nantes forward Emiliano Sala, though are reluctant to cough up £20m.Blackburn, Brentford and Hull are forming an orderly queue to take Ben Woodburn on loan, with the 19-year-old winger set to be recalled from Sheffield United by his parent club, Liverpool. Also in the Championship, Wigan have given Sunderland the green light to sign Will Grigg, who has scored only once in the league since August. And keen to put out fires at the other end are Nottingham Forest, who are ready to snap up the Leicester goalkeeper Eldin Jakupovic on loan until the end of the season. Marko Arnautovic’s brother, Danijel, has revealed that the player desperately wants to move to China immediately. “West Ham bought Marko for peanuts. Now they have a fantastic offer,” he said. “It is his great desire that West Ham accept the offer from China.” West Ham however are “refusing to be bullied”, according to the Sun, and plan to hold him to his lengthy current deal. The Hammers are also keen to sign Jonjo Shelvey, even if – according to the Mail – they face “fierce resistance” from his current club, Newcastle. “Manuel Pellegrini admires Shelvey and would jump at the possibility of bringing him to the London Stadium,” they report, but “Newcastle boss Rafa Ben?tez would not sanction the sale unless he was able to bring in a suitable replacement.” Whether Paris Saint-Germain’s Christopher Nkunku, a 21-year-old midfielder with whom they are linked today – along with his 19-year-old defensive teammate Stanley Nsoki – counts is unknown. Rumours that Arsenal are about to sign Yannick Carrasco for £25m are wide of the mark, says Unai Emery. “We can’t pay for anyone,” he said. “We cannot sign anyone permanently. We can only sign loan players.” Emery also gave gnomic updates on a couple of persistent rumours, concerning the Sevilla midfielder Ever Banega (“I know this player and he is a very good player. I cannot tell you more.”) and Barcelona’s Denis Suarez (“I know the club is working on possibilities of which players help us with big performances like we need now.”). Watford have approached Lyon to discuss a potential move for the 22-year-old French winger Maxwel Cornet, author of three Champions League goals against Manchester City this season but with just one league start to his name, having been “alerted to his availability”, according to the Independent. He would cost, according to the Sun, around £20m and is also being pursued by Milan.